The annual Strawberry and Justice Festival examines many of the social and environmental issues behind one of the Monterey Bay region’s most important agricultural crops. The annual Strawberry and Justice Festival examines many of the social and environmental issues behind one of the Monterey Bay region’s most important agricultural crops. This year’s festival also features live music, free food, and guest speakers that include community members involved in saving Santa Cruz’s Beach Flats Garden, along with a presentation on the history of the Bracero Program. This free event takes place Thursday, May 19 from 4–6:30 p.m. at the Hay Barn at UC Santa Cruz, near the campus’s main entrance. Available will be fresh organic strawberries and agua fresca made from berries grown at the UCSC Farm and local farms from Watsonville to Salinas, along with campus and community organizations’ interactive tabling activities, and tours of the adjacent UCSC Farm. Featured will be a special performance by Diana Gameros, winner of the Emerging Leader Award from the Chicana/Latina Foundation for her work in music and social justice activism. Gameros creates authentic, inspiring music that reflects the 21st century experiences of a young indie artist at the borderlands between cultures, languages, and genres. 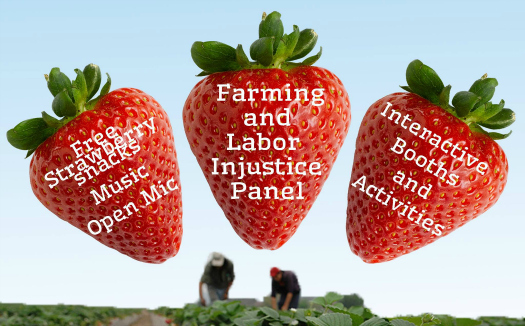 In addition, a dynamic panel of leaders will discuss local, community injustices as well as worker oppression in strawberry production. Panelists include Ann Lopez, Michelle Glowa, and two Beach Flats Garden jardineros, Emilio and Federico. Lopez, author of The Farmworkers’ Journey, has worked with farmworkers in Central California for the past 18 years. Michelle Glowa is a UCSC environmental studies and sociology professor studying food justice and urban agricultural movements in California. Santa Cruz’s Beach Flats Garden is a long-established community garden boasting agricultural and cultural diversity that is now being threatened by commercial development. A second discussion panel features a Cal Ag Roots Story Listening Session on the Bracero Program, a guest worker program that ran from 1942–1964. Ildi Carlisle-Cummins, Cal Ag Roots Project Director at the California Institute for Rural Studies, and Ignacio Ornelas, Ph.D. candidate in history at UCSC and archivist at Stanford University, will tell the story of a key moment in farm labor history: the organizing that ended the Bracero Program and launched the United Farm Workers Union. Daniel Ruanova, a Tijuana-based artist who works in multiple media and has partnered with Ornelas to produce powerful pieces that tell the Bracero story visually as part of the Bracero Legacy Project, will join the second panel session. This story is part of a series of Cal Ag Roots stories that unearth hidden histories of California farming in order to place current California food movement work in a historic context. This year’s festival takes place at the new Center for Agroecology and Sustainable Food Systems (CASFS) Hay Barn near the intersection of Coolidge Drive and Ranch View Road. Parking is available in the lot at the corner of Coolidge Drive and Carriage House Road. Permits will be available for $4, and parking is free after 5 p.m. The event is sponsored by the UCSC Food Systems Working Group, with support from Measure 43 and the CASFS. More information is available at ucscfswg@gmail.com and 831-459-3675.